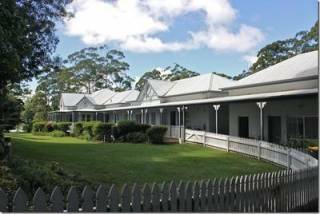 AURA » Australia » QLD » Guest houses in North Tamborine » Amore Mt. Tamborine. For your convenience, there is a bar fridge, tea, coffee, biscuits, port and chocolates, Lcd tv, dvd, cd, reverse cycle air conditioning and electric blankets (for those chilly winter months). As you would expect Free WiFi is available in your room and elsewhere within the building. The very pretty Wedgewood room features soft blue hues and crisp white decor. This room emits warmth, charm and elegance. A comfortable King Size Bed with mattress topper, electric blanket, and beautiful doona cover. To ensure your sleep quality is of the highest order, block curtains are in place. A verandah for relaxing, port and chocolates before retiring for a restful night's sleep, and of course Free WiFi. The light bright and pretty Wedgewood room will meet your expectations. This enchanting room has access to a very large verandah which overlooks the side and front gardens. For your convenience, there is a fridge with tea, coffee, biscuits, port and chocolates, Lcd tv, cd, dvd, ceiling fan, reverse cycle air conditioning and electric blanket (for those chilly winter nights). . This stylish room features a comfortable king size bed with mattress topper, electric blanket and an elegant doona cover and block out curtains for sleep quality. For the extra guest, there is a single bed. The room also incorporates a large en suite, small private verandah overlooking the rear peaceful garden. 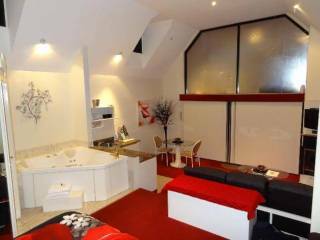 This room is centrally located on the ground floor, adjacent to the beautiful lounge room . For your enjoyment, port and chocolates are provided as a nightcap before a restful night's sleep. A room to relax and unwind. Spoil yourself by snuggling up in your king size bed with the beautiful gold doona cover and don't forget to enjoy the bath spa. Why not pamper yourself with an in room therapeutic massage - rejuvenate your spirit as well as your body! Down and feather king size pillows are available upon request. Also for your pleasure is the large verandah which overlooks the attractive front gardens. Just the place to watch the world go by whilst sipping on a glass of wine. For your convenience, there is a bar fridge with tea, coffee, biscuits, port and chocolates, Lcd tv, cd, dvd, ceiling fan, reverse cycle air conditioning , electric blanket (for those chilly winter nights) and of course Free WiFi. The Doulton room will not disappoint! If you are looking for exceptional accommodation situated close to the heart of everything – then look no further.Amore is across the road from the yummy cheese factory and boutique brewery. Gallery Walk is just a 2 minute walk to shops, cafes, restaurants, galleries, cellar door outlets. Stroll to three National Parks and experience an invigorating rainforest walk. 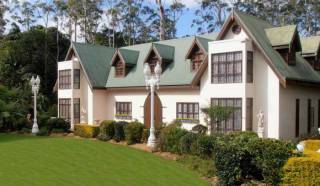 Amore is perfectly placed to explore Tamborine Mountain. Gold Coast Theme Parks are just a 20 minute drive away. Because of our enviable location our rates are on a Room Only basis. We find that 99% of our guests elect to do their own thing, get up in their own time, and wander down to Gallery Walk and enjoy breakfast in one of the Cafes/Restaurants there. We therefore offer our Guests an option -- breakfast at Amore or breakfast elsewhere --guests' choice ( 17.50 per person if you elect to have a large healthy continental breakfast with us ). YOUR ACCOMMODATION: You will feel that you have stepped back in time but of course modern conveniences are included such as free Wi Fi which is available from your room. Simply put, the four rooms are spacious and beautiful. Some rooms have antique furniture and all feature king size beds, private verandahs (where you may see the wildlife that live in the garden) and blockout curtains to enhance your sleep quality. All rooms are ensuited and equipped with quality linen and toiletries. The rooms feature bar size fridges excellent tea, coffee, biscuits and for a night cap, enjoy complimentary port and chocolates. FACILITIES: Enjoy the charming lounge room with the baby grand piano, extensive and interesting library and comfortable lounge furniture. Snuggle up or stretch out and spend sometime leafing through a magazine, reading a book from the library or enjoy playing a board game. In the cooler months the fireplace is blazing and the glowing embers are very soothing. DINING OUT Fine restaurants are within walking distance. You have a choice of Indian, Seafood, French and a la cart. If you enjoy Irish, Italian, Japanese, Chinese or Polish cuisine they are only a 4 minute drive away. If you have elected to select one of our breakfast options as part of your package your breakfast will be served in the delightful breakfast room using Royal Doulton china and traditional silverware, adding that extra touch to start the day – relaxed – and eager to explore all that Tamborine Mountain has to offer. . If you enjoy wine, cheese or beer tasting, browsing art and craft galleries, or experiencing the pleasures of walking in a national park, there is no need to think about driving – they are almost at our doorstep. 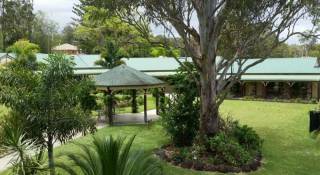 Hosts Kay and John are long time residents of Tamborine Mountain and are most happy to share with you the history of the Mountain and provide all the tourism information required for a wonderful stay. 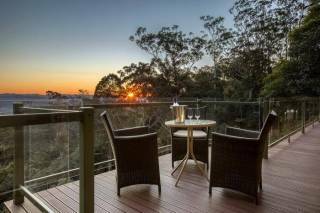 With the perfect location, comfortable airy private rooms and reasonable rates, all on the little piece of paradise that is Tamborine Mountain Amore is the ideal place to stay…. LOCATION, LOCATION, RELAXATION------YES IT IS TIME!! YOU ONLY LIVE ONCE -----LIVE BEAUTIFULLY. Deposit 50%. Balance is payable upon check in.